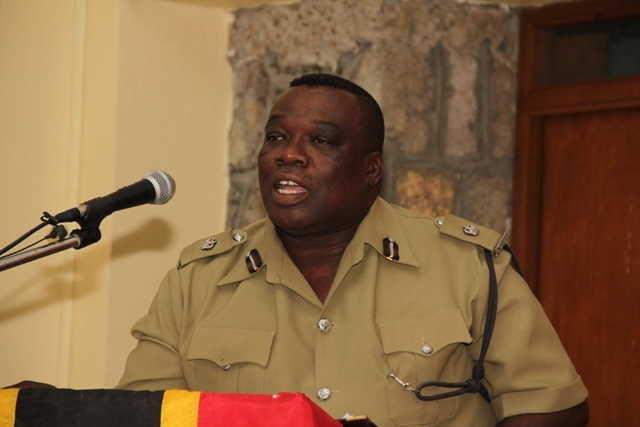 NIA CHARLESTOWN NEVIS (January 06, 2014) — A senior Police Officer of the Royal St. Christopher and Nevis Police Force Nevis Division announced on June 05, 2015 that in 2014 there was a 27.3 percent decrease in crime on Nevis over that of 2013 which represented a total of 107 crimes and described it as a healthy performance. Divisional Officer Superintendent Hilroy Brandy made the disclosure when he addressed officers stationed on Nevis at the annual New Year’s gathering. The event was held at the Charlestown Police Station on January 05, 2015. “As you are aware, in 2012 the Strategic Planning Group drafted this Division’s Policing Plan for the period 2012 to 2014 with the theme, “Strengthening Partnership to Build Safer Communities.” Our goal was to reduce crime by 30 percent over the next three years, over the 2011 total of 392. “In 2012 there were 368 crimes and the percentage solved was 46 percent. In 2013, there were 392 crimes and the percentage solved was 43 percent. In 2014 there were 285 crimes and the percentage solved was 45 percent. This indicates that we fell short of our goal by 10 crimes or 2.8 percent. Notwithstanding this, reducing crimes by 27 percent while maintaining the percentage solved, is a very creditable performance,” he said. The Divisional Officer told the Officers, that if they were to be successful with the two-year plan, they had a vital role to play in crime fighting and the protection of people. To the community he said, the Police had to rely on the support of responsible law-abiding citizens, local communities and partner organisations to tackle crime and make the neighborhoods, towns and villages better and safer places to live, work and visit.